Whether you hope to become a professional musician or just love playing music with others, the welcoming and friendly community of NYO is for you. We explore and perform an exciting repertoire of orchestral masterpieces and contemporary works by the foremost composers of today, challenging our players to stretch themselves as musicians and think about what it means to be in an orchestra in the 21st-century. 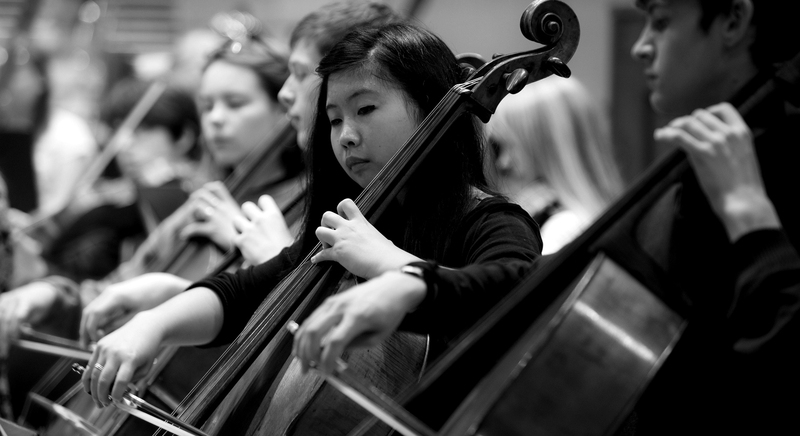 Our tutors are world-class professionals and outstanding orchestral musicians in their own right, and are passionate about supporting our musicians to excel. Playing in the NYO...was not only a massive challenge, but also incredibly inspiring. It completely changed my life, and inspired me with the aspirational values that have guided me since then. Peer learning and support are central to NYO. Our rehearsal residencies take place three times a year in the school holidays, and our musicians are active in ensuring each other's happiness and security during those times. NYO's Leader and Principal Players have a vital role in inspiring other NYO Musicians to rise to the challenge of the orchestral repertoire, and are given dedicated leadership training to support them. on with lots of different types of people, about excellence in the arts, about how to really listen. NYO is also more than just an orchestra. We are artists, ambassadors, and aspiring leaders, encouraging other young people to embrace orchestral music, particularly through our NYO Inspire programme. NYO Inspire is a national programme led by NYO musicians who share valuable tips on playing with other young musicians. I find teaching very rewarding….It feels like a big family with each teacher passing information down from generation to generation.